No, your eyes are not deceiving you — this book is actually titled Rainbow Magic, and yes, there are not one but two very creepy Mac Davis lookalikes on the cover. Taryn scoffed at the village theory. How could a special rainbow bring about a change in one’s life? But when she saw it, she couldn’t help her growing excitement. Her meeting with Luke Major immediately afterward was a distinct letdown… and a shock. Luke was an exact replica of Taryn’s ex-fiance. And Taryn could do without the kind of changes he had made in her life! And there’s more! Do go on over to Goodreads and read this hysterical review of this gem. 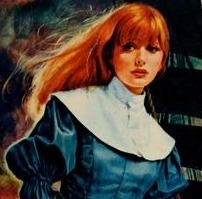 Categories: Hideous Romance Novel Covers | Tags: Harlequin, I love the 1970s, Margaret Mayo, questionable fashion choices, Rainbow Magic, unintentionally hilarious book titles, unintentionally hilarious romance novel covers | Permalink. Abbie knew that she was taking a risk, but it seemed to be a gamble that might pay off. Malachi Garrett, brilliant engineer-inventor, was so reclusive that hardly anything was known about him. Now here he was, in a bar in Oklahoma, looking for someone to drive his Shelby Cobra car in a race to Washington DC. As a freelance journalist, Abbie couldn’t pass up the chance. Rarely do we ever open a book with absolutely no preconceptions. We know a little about the story from a blurb, or have read a review, or picked the book up upon recommendation from someone whose taste we trust. It’s wonderful when the book aligns with those preconceptions, even better when it exceeds them. When neither happens, then you know how I felt after reading Impulsive Gamble. Every review I’ve seen for this book is positively gushing. On Goodreads, the book gets slightly over four stars, which, though the book has few reviews, is still remarkable. It’s possible that all this high-heavens praise created impossible-to-meet expectations, but although I enjoyed Impulsive Gamble, I was underwhelmed. I loved Mal and enjoyed Abbie, and the cross-country endurance race plot is one I’d never seen in a romance. But there are holes in the plot big enough to throw a cat through, and problems with the characterizations that made even the book’s much-lauded sparkling dialogue between the two leads hard to swallow. Mal is an engineer and ex-racing driver who employs multiple mechanics, yet he can’t find anyone to drive the car? Please. The guy spends years and a chunk of change on this car, and trusts it to a complete stranger? Not in this lifetime — my baby is a lowly-but-sweet 1985 Chevy truck, and I can count on one hand the number of people I know who’ve been allowed to move it. also — you don’t go out on cross-country endurance race without a mechanical crew behind you. It just wouldn’t happen, and there was no logical reason for it to happen here. we’re told over and over by Abbie that Mal is such a male chauvinist, and yes, he often acts like one, yet he cooks, he cleans, he lets a woman drive his masterwork car and readily admits to being a reckless driver and terrible navigator. Never once does Abbie notice that he’s saying one thing and doing another completely, but we’re supposed to believe she’s a brilliant newspaper reporter. Right. the back-and-forth arguing between the two was supposed to seem like foreplay, but sometimes it just seemed like instant replay. the book’s ending (I won’t spoil it) is supposed to tie everything up in a neat bow, but leaves as many questions as it provides answers. If it sounds like I’m being a little rough on the book, maybe so. But I actually enjoyed reading it just for Mal — he’s one of the best-written male leads I’ve ever come across in a vintage Harlequin/Mills & Boon. Oddly enough, I think part of my problem with Impulsive Gamble was that Emma Richmond’s Heart In Hiding was so fresh in my mind. 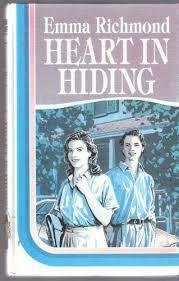 Heart In Hiding is a similar story, but with a much more believable trajectory and, in my opinion at least, a more enjoyable capable-female-meets-curmudgeonly-male story line. I give Impulsive Gamble 3 out of 5 intact fan belts, one for the quirky plot, one for the high points the dialogue hits, and another for Mal. I give Mal 5 out of 5 bags of pretzels. Categories: 3-Star Reads, 5-Star Hero, Good Idea Wasted, Hideous Romance Novel Covers, Reviews, Romance, Vintage Harlequin/Mills & Boon | Tags: 3-star reviews, Harlequin, hero to drool over, Impulsive Gamble, Lynn Turner, Mills & Boon, racing in romance, Reviews | Permalink. Rugged men who are not afraid to wear orange shirts with kite-sized collars! Polyester (yes, friends, you can tell just by the illustrations that every fabric in sight is 100% man-made)! There’s no way the book lives up to this cover. Just not happening. Categories: Bizarre Romance Novel Covers, Vintage Harlequin/Mills & Boon | Tags: Anne Hampson, Beyond the Sweet Waters, Harlequin, heroine chic, manly men in strange garbs, so bad it's good | Permalink. The wolf at the door looks more like a lecherous silver fox to me. Or the Incredible Hulk, what with his monstrously big hand primed to break our heroine’s wrist. Categories: Hideous Romance Novel Covers, Random | Tags: Harlequin, Hideous Romance Novel Covers, manly men in strange garbs, silver foxes looking for romance, strangely proportioned body parts | Permalink.